The decision by Nairobi Governor Mike Mbuvi Sonko to temporarily lift the ban on matatus from accessing the Nairobi central business district is not new. Earlier attempts by his predecessors and ministers for transport in the previous regimes to implement the ban have never been successful. The issue has been recurring and in August this year, the county government announced that only two matatus per sacco in a given route would be allowed into the CBD and would be allowed only five minutes each to pick and drop passengers in allocated stages. April 2018: Matatu operators threaten to ground operations if the county government of Nairobi bans them from accessing the CBD, citing lack of enough space to accommodate the high number of public service vehicles plying the various city routes. September 19, 2017: Governor Sonko is forced to rescind the planned ban after his attempts to enforce it are met with immense opposition from the Matatu Owners Association officials lead by its chairman Simon Kimutai. Governor Sonko at the time gives the matatu owners a one-month grace period to regulate the flow of their vehicles in the CBD and vows to enforce the ban if the matatu owners will not have worked out a strategy to manage their vehicles within the given period. 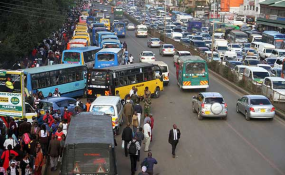 The then acting county secretary Leboo ole Morintat even hints that the matatus could be allowed to stay in the CBD for good as long as they observe the strict traffic rules and abide by other rules such as not double parking, not obstructing traffic or playing loud music within the CBD and its environs. Former Nairobi Governor Evans Kidero also tried to ban the matatus from accessing the CBD with no much success. March 2016: Former Nairobi Governor Evans Kidero announces that his government was banning matatus from the CBD in a bid to de-congest the city and that passengers are to be picked or dropped at designated areas. March 15, 2015: Dr Kidero bans all commuter matatus from the Nairobi CBD with the aim of de-congesting the city. The decision is publicly opposed by Mr Sonko, then Nairobi Senator. Mr Mohammed Abdullahi, the Transport minister in Dr Kidero's administration at the time insists that the ban is lawful and there is no backtracking on it. "We know that this is a tough process, but we will have to push it through in order to create sanity in the CBD. We urge business people to be patient as we put in place measures to decongest the CBD," Mr Abdullahi said then. The ban does not take effect after Dr Kidero cedes ground and agrees to dialogue with the matatu association's leaders and the situation remains unchanged until he exits office in 2017 after losing to Mr Sonko in the August General elections. March 2014: Transport Cabinet Secretary Michael Kamau has a rough time implementing the new public service vehicle regulations after the Kenya Country Bus Owners Association vows not to comply with new rules and obtain a court order restraining him from enforcing the regulations. The late John Michuki, who was the Transport minister in the Mwai Kibaki administration, is accredited with spearheading reforms in the matatu sector by initiating the famous "Michuki rules". But he also failed to phase out the PSVs from the city centre during his tenure though his main target was to transform the sector, instil discipline and reduce the number of road crashes in the country. Similar attempts in the past to flush out matatus from the city have failed. 2008: Local government minister in the grand coalition government Uhuru Kenyatta announces plans to move matatus plying the Jogoo road route to Muthurwa upon the completion of the construction of a bus terminus earlier in 2007. But the plans do not materialise after it is opposed by Mr Sonko who goes to court seeking orders restraining the government from implementing the directive.